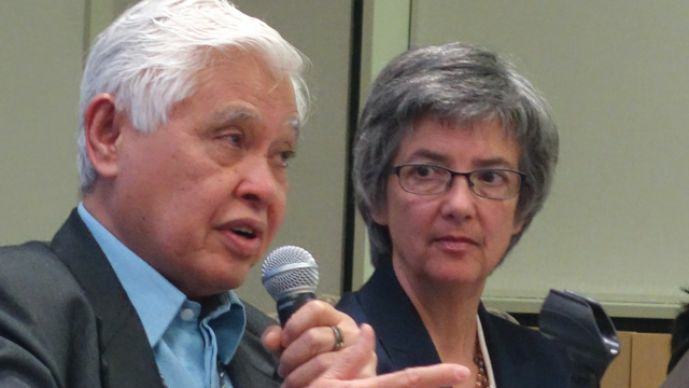 Retired Bishop Daniel C. Arichea Jr. describes his personal journey during an online dialogue on human sexuality, held April 29 by the United Methodist Connectional Table. Bishop Hope Morgan Ward listens. The draft would be brought back to the Connectional Table at a future meeting for consideration. The April 29 decision to draft the legislation came the same day the Connectional Table began a series of three public discussions on human sexuality. The dialogue “is an exercise of our responsibility to be a common table for the church and to confer with one another as representatives of the church,” said Dakotas-Minnesota Area Bishop Bruce R. Ough, Connectional Table chair, the day before the event. The 59-member Connectional Table is a United Methodist governing body of clergy and lay people that coordinates the denomination’s mission, ministry and resources. Any legislation adopted by the body would go to the denomination's top lawmaking assembly, General Conference, for action in 2016. The April 29 dialogue was live-streamed on the denomination’s web site, UMC.org, and viewed by people in 11 countries. The group plans to host similar dialogues during its next two meetings, concluding at its February 2015 meeting in Liberia. Raleigh (N.C.) Area Bishop Hope Morgan Ward, the chair of the Connectional Table’s Human Sexuality Task Force, served as moderator for the morning’s discussion. She told those gathered in Chicago and online that the hope is these public discussions will lay the groundwork for any substantive change the Connectional Table proposes to General Conference. The possibility of changing the church’s stance on homosexuality came up soon after the Connectional Table returned from lunch. The Book of Discipline, the global denomination's law book, states that all people are of sacred worth but "the practice of homosexuality is incompatible with Christian teaching." Los Angeles Area Bishop Minerva Carcaño proposed beginning the process for greater inclusion of gay, lesbian, bisexual and transgender individuals. She did so following the urging of the Rev. Julie Todd, a member of Love Prevails. Todd’s unofficial United Methodist group advocates the inclusion of gay, lesbian, bisexual and transgender people in the life of the church. Carcaño said she had not expected to make such a motion at this Connectional Table meeting but felt led by the Holy Spirit. What followed was a discussion that lasted nearly two hours and at times included motions to table Carcaño’s motion until the end of the public dialogue. Other members expressed concern that, with the rapid approach of the 2016 General Conference, legislative wording needed to be worked on now. The body would need to approve such legislation before it could be submitted to General Conference. A number of members said they saw a need to eliminate “discriminatory language” in the Book of Discipline. The deadline for petitions to General Conference is Oct. 13, 2015. General church agencies and the Connectional Table are urged to submit petitions by Sept. 1, 2015. The body narrowly voted – 17-15 – against a subsequent motion to reconsider that action. The church’s divisions on homosexuality have made headlines in recent months, and, not for the first time, some church members have mentioned the possibility of schism. The April 29 discussion included clergy and scholars who approached the topic from various theological perspectives. In its Book of Discipline, The United Methodist Church states that all people are of sacred worth but "the practice of homosexuality is incompatible with Christian teaching." The book affirms "the sanctity of the marriage covenant that is expressed in love, mutual support, personal commitment, and shared fidelity between a man and a woman." Church law bans United Methodist clergy from performing, and churches from hosting, "ceremonies that celebrate homosexual unions." It also bans “self-avowed practicing” gay individuals from serving as clergy. For more detailed information, seewww.umc.org/homosexuality. Ough called the panel discussion a historic conversation that attempted to engage the entire United Methodist Church through live-streaming and Twitter. San Antonio Area Bishop James E. Dorff opened the discussion with a Bible study based on Jesus’ prayer for his disciples’ unity in John 17:20-26. Dorff told those in Chicago and online that Jesus prayed for unity so that Christians can be a witness to the rest of God’s people. ·Retired Bishop Bishop Daniel C. Arichea Jr., who served in the Philippines and has written multiple Bible commentaries. The Rev. Mark Teasdale, an ordained elder and E. Stanley Jones assistant professor of evangelism at United Methodist-related Garrett- Evangelical Theological Seminary in Evanston, Ill. The Rev. Pamela Lightsey, an ordained elder and associate dean for community life and lifelong learning at United Methodist-related Boston University School of Theology. She is also clinical assistant professor of contextual theology and practice. Arichea said the topic of human sexuality has come up at every global denominational gathering he has attended. But for him, the topic ceased to be academic when his son, then a student at Duke University, told his parents he was gay. Arichea said his son struggled to remain involved in a church he perceived as hostile to him. But today, his son is an active member of Foundry United Methodist Church in Washington. In many ways, Arichea said, the dispute comes down to different understandings of Scripture. At the end of his presentation, he said he views human sexuality as “a gift from God” and that people’s ministries should be judged by their gifts, not their sexual orientation. Lightsey, who identifies as “queer,” offered a different take. A veteran of the U.S. civil rights movement, she urged United Methodists to take inspiration from the Rev. Martin Luther King Jr.’s “Letter from a Birmingham Jail” and his call for direct action. “Conversation without changing injustice is still wicked oppression,” she said.